One of the best kept secrets of stitching and quilting witches, are the pincushions made by Portella Carbunkle! She’s a very wise and sewing savvy witch who, long ago, spirited up a pincushion that would enchant all needles and pins stored in it. It will then give the user magical stitching abilities. We ALL need that, right?? Portella also claims that the more bits and bobs and little cute goodies you put on the pincushion’s hat brim, the stronger the enchantment! That’s enough encouragement for me to search high and low for fun things to stick on mine!! 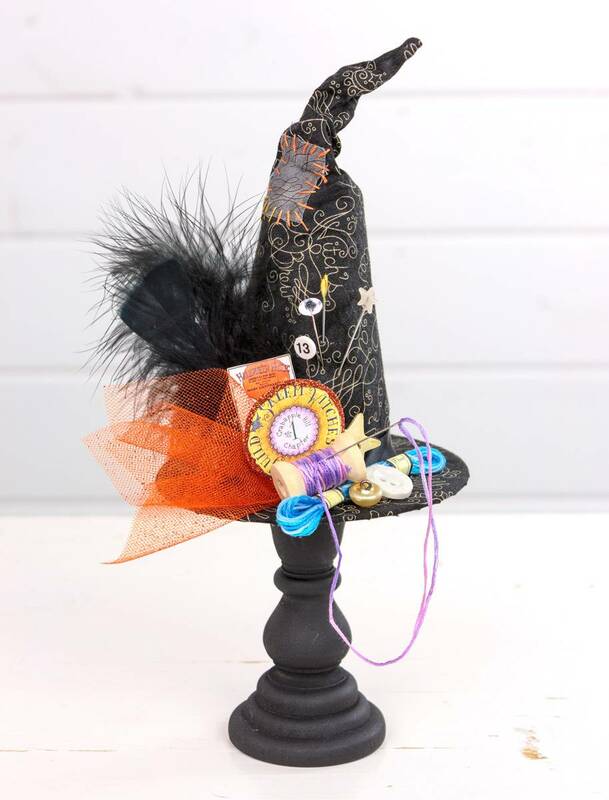 Pattern includes instructions for making the pincushion and a miniature skein of floss, and a selection of full color miniature Halloween postcards and Salem Quilt Guild emblem. Fun little stuff such as a little spool, embroidery floss, needle, thimble, buttons, tulle ribbon, ribbons, feathers, spider, spiderweb, glitter... The possibilities are endless!